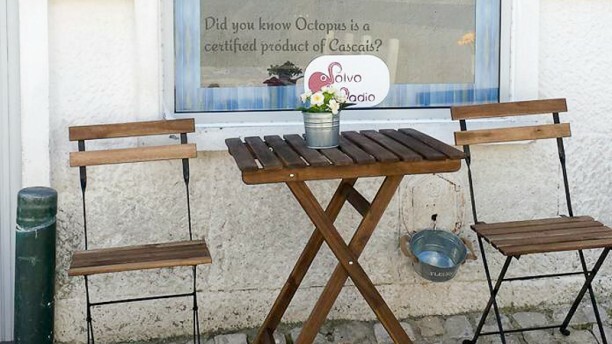 O restaurante Polvo Vadio fica no centro da pitoresca vila de Cascais. Local onde o bom gosto impera, no Polvo Vadio o ambiente propícia à partilha e convida a ir ficando, para se desfrutar sem pressas. Espaço onde irá saborear as melhores receitas de Polvo, portuguesas e italianas, tomando um bom vinho ou uma cerveja artesanal. Faça uma pausa na agitação diária e venha desfrutar de uma agradável refeição entre amigos, no Polvo Vadio. Car park Parque Hotel Baía (fecha às 24H), ruas circundantes, atenção aos parquímetros! Perfect place to go for a nice romantic couples night out. Small and intimate maybe enough room for six couples max, lit by candles and nice and quiet thanks to their reservation only policy. Food was amazing we got fried octopus for an appetizer and 2 of the main dishes on ways to prepare octopus all were perfect, and melted in your mouth. For desert we got their house special which was like a custard with strawberries and chocolate and it was also amazing. Everything was fresh and delicious and I would definitely recommend this to anyone wanting to spend a nice night out. Staff was friendly and even though my Portuguese is only semi-decent it was easy to communicate with them. Would definitely go back! Amazing food, friendly people that want to make your experience pleasant in every sense. Overall, very happy! If you love octopus, quaint restaurants and personal service, please come here for dinner. The food was amazing, the wine was cold and the service was attentive. It felt family run, the love and care was evident and the food was delicious. I wish I could go back here to try every dish. Surprising when you arrive, just a few tables next to the kitchen ... When the dish arrives we take full eyes and delights. We ate octopus, their specialty. The service is like cooking, impeccable. Bravo and Obrigado. What a wonderful dinning experience. We knew in advance that this was a very small restaurant and that we would need to make a reservation. We arrived right before the place opened and waited and it opened at the exact time it should and we were seated. Every dish was amazing and the staff was attentive to every detail. Of course the space was very limited but we were expecting that and therefore do not see it as a negative. When we are back in town, we must visit it again. This restaurant is a gem. It can seat 14 people in total and is always a great dining experience for anyone who appreciates octopus cuisine. My wife and I chose different dishes and both were very delicious. For dessert we had the almond tart and that was lovely. The owner, Paula is very welcoming and friendly, and it is so nice to be remembered from previous visits and be made to feel at home. We were served by Rita who too was very friendly and attentive and very helpful to anyone needing help to chose from the menu. For my wife and I today’s bill came to Eu.37 which included drinks, and that is very reasonable. We are repeat diners at this restaurant. I really like all dishes that I ordered, but prices in the menu differed from those indicated at Thefork. Very good octopus, staff is very nice and speaks English well. It is very small so reservations are needed. Only complaint is that it was quite cold in the restaurant. Just a wonderful experience from start to finish! The service was excellent, very warm and welcoming, helped us pick a few dishes that we loved. The octopus was tender, cooked perfectly, so tasty. Would recommend highly!! Most amazing Food with a really lovely hostess. Definitely worth the trip from Lisbon to Cascai. Restaurant is very small....so much so that you can touch your neighbour at the next table. Food was excellent, but if you don't like octopus, you should not go there. Waited a while for our food, and to get check. Seems other tables with regular customers were getting more attention. Octopus lovers, you just have to try it. We reserve a table and really excited to come taste the polvo but we' ve been désapointed . Needs to improve guest service, we arrived on time and they were not ready, but they sent us out. Once in place they changed us to accommodate a bigger group. Not really good on how to treat guests and the experience they bring with not caring. OMG there is a very good reason this place ranks #2 in Seafood for Cascais....it is amazing. Tried 4 diff octopus dishes and they were all wonderful. I have never has such melt in you mouth tender octopus anywhere. Full of flavor and beautifully served. Excellent service and special thanks to the lovely waitress who shared some cooking techniques so I could attempt some of these dishes at home.